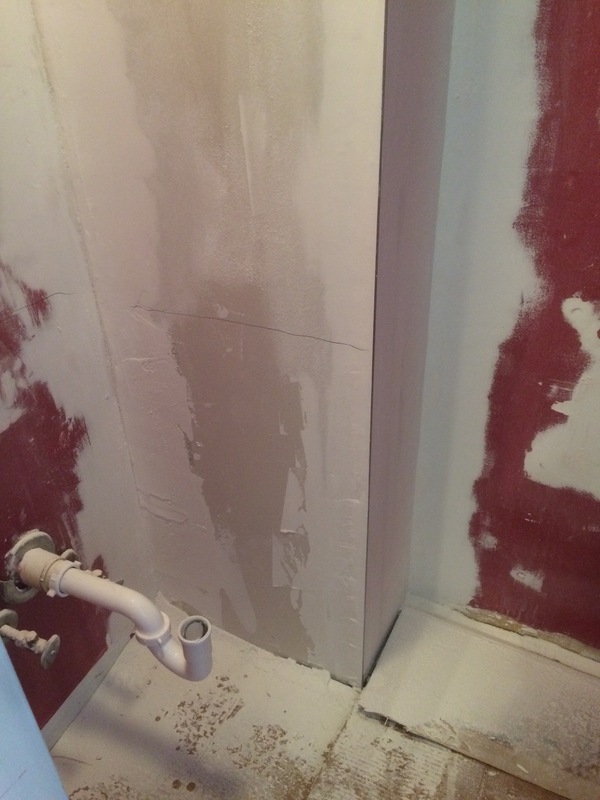 Posted on April 6, 2018 by Thoennes Studios, Inc.
After a #remodelingproject which included a complete tear out, the new drywall and mold proof tile backing, electrical, plumbing rehab, ceramic wood-look flooring, carpet, light fixtures, vanity, sink and faucets, shower head and valve, toilet, wall heater, exhaust fan, paint shower basin, glass shower doors, and last but not least for these aging baby boomers is a shower shelf that doubles as a grab bar… just in case one would need that at some future date. Ready for guests and ready for the next project. Posted on April 4, 2018 by Thoennes Studios, Inc. This shows a before and in progress refinishing of a garage door that was in need of more than just another coat of varnish. Some of the rails and panels towards the bottom of the door were beginning to rot, and most of the existing finish was already beginning to peel. Posted on April 3, 2018 by Thoennes Studios, Inc. Dark stains and finishes are still on their way out. White is still king. 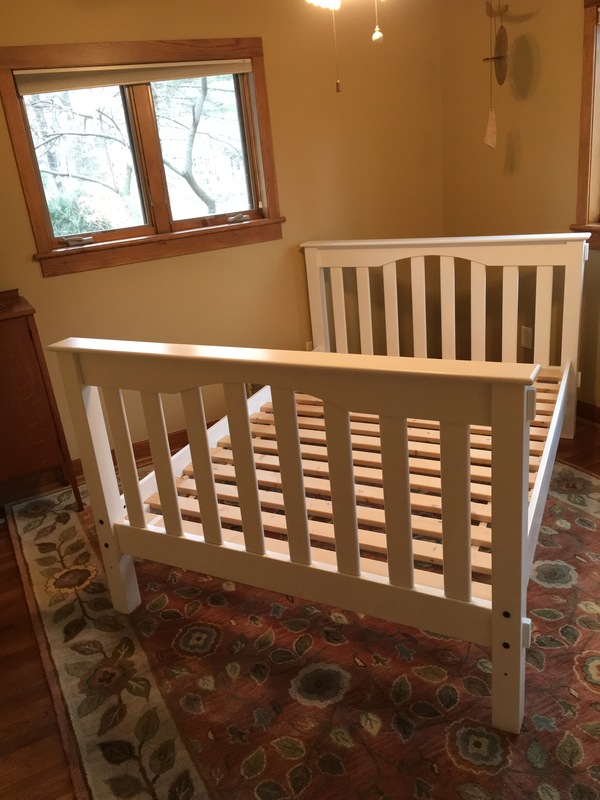 Here is a #PotteryBarnKids Kendall full bed, that has gone from it’s beat-up dark Tuscan finish to a clean, restored and professionally finished white (Benjamin Moore Distant Gray). Sanding smooth, filling, priming, and three coats of Benjamin Moore’s best paint with sanding between coats. 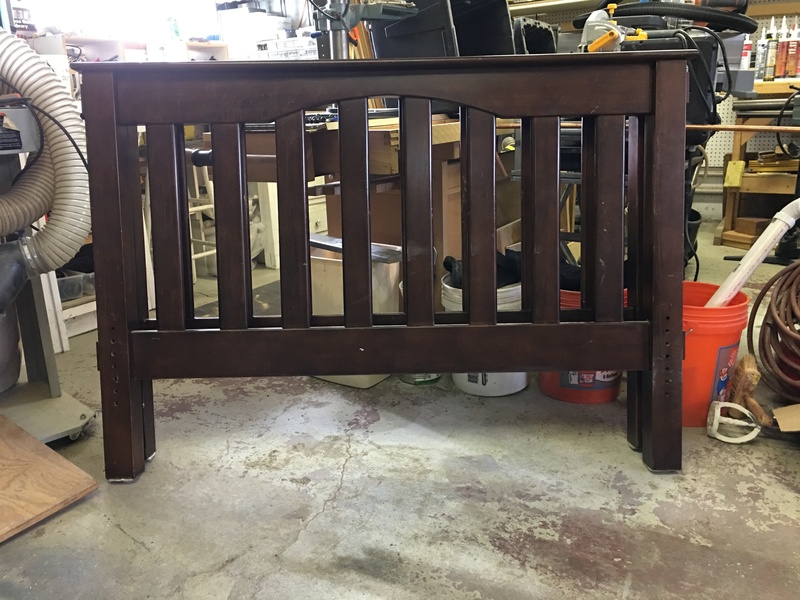 This is a solid wood headboard and footboard, with solid wood seamed spanning struts for the mattress support. $799 comparable value from Pottery Barn. You pick up for $250. Let me know via email or phone call if you’re interested. Posted on April 2, 2018 by Thoennes Studios, Inc.
Greg’s passion, hobby and profession. “I love what I do, and I do what I love.” This design was a custom install for a family in San Antonio, Texas. They wanted part of the design to block out the space trees in the distance, and some of the design to be clear to show the nearby landscaping. 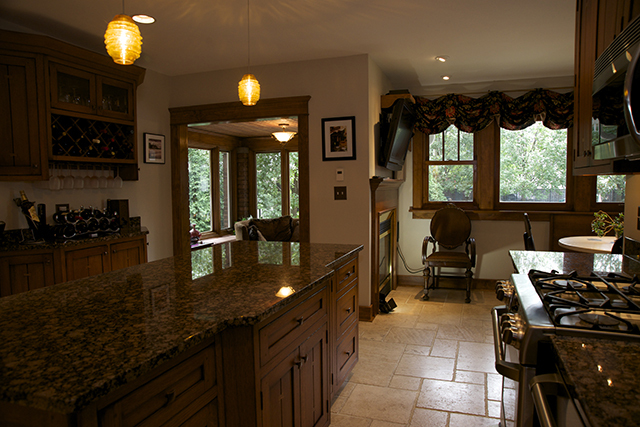 The entire project was designed, produced and shipped from Greg’s home and studio in Glen Ellyn Illinois. Greg is an expert trim installer, and this project in Glen Ellyn required removal of old, various baseboard and quarter round pieces, and replacement with new 7-1/4″ pre-primed Colonial Baseboards and 3/4″ quarter round. All 800′ were painted in Greg’s shop with the latest HLVP sprayer using #Benjamin Moore #Advance “Distant Gray” semi-gloss paint. Crown moulding was installed with custom stops and ends. Posted on October 9, 2015 by Thoennes Studios, Inc.
Before shot on the left shows the existing plumbing prepped and ready for the new vanity and sink. 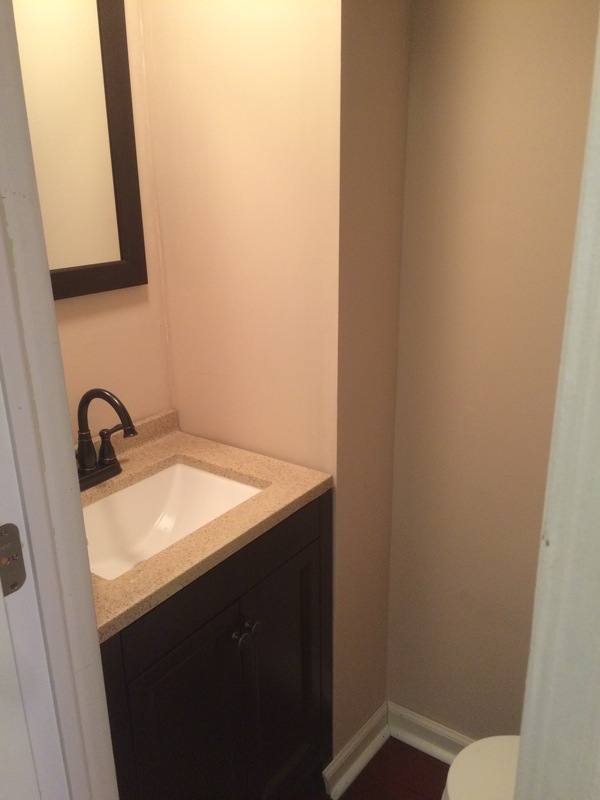 But first the corner wall had to be moved at least 1/4″ to allow for the minimum 25″ vanity with sink and counter. The laminate flooring was kept, and the toilet sewer pipe was revealed from the basement side, then carefully cut out of the flooring. The vanity with top, and mirror from Home Depot was only $150, the dual-flush elongated toilet was $99. The room was primed (to cover the drywall patching and several dozen patched holes from the shelving), then painted with a dark mocha brown on the ceiling, warm caramel sand on the walls and white trim and baseboards. Tiny but mighty! 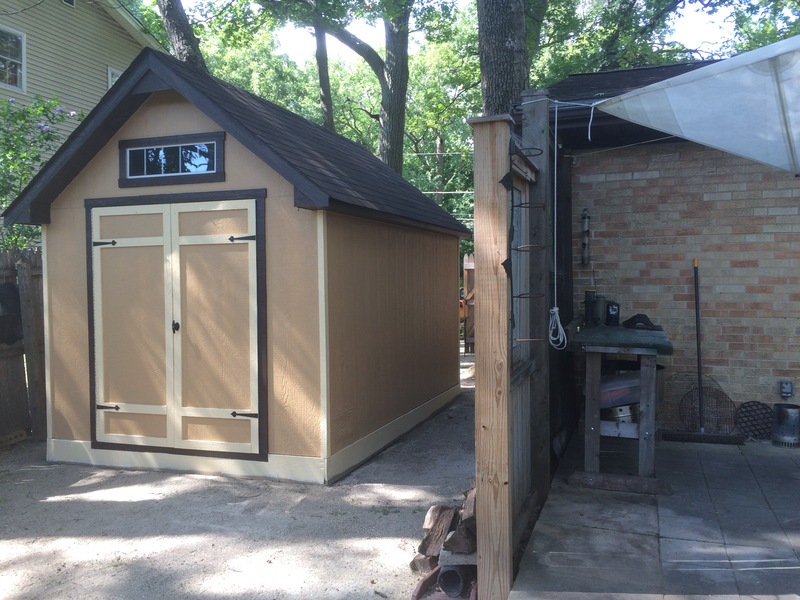 This is a 8 x 10 Shed kit ordered through Home Depot. Complete with all 2 x 4’s and wall panels, roof underlayment, doors, hardware, etc. The only element having to be purchased was the roofing paper and shingles, and paint. It required about two complete days to build by my self, and a day more (spread over a few days) to caulk & paint with color scheme that would go with the brick of the house. About $2,500 total for the kit, labor and paint. 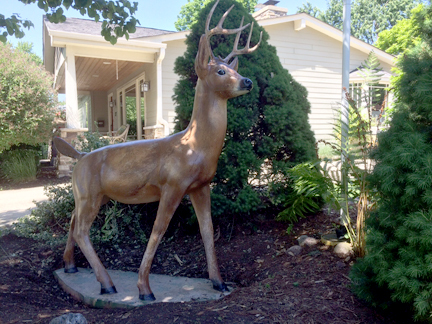 Posted on June 16, 2015 by Thoennes Studios, Inc.
A cement deer was going to be cleaned, restored and repainted. 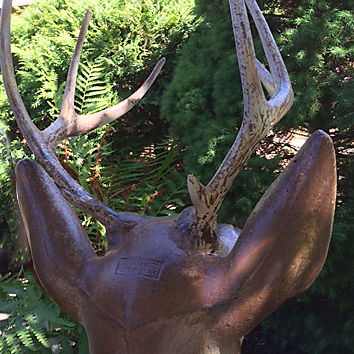 The request was to make it look like a real White Tail buck. With it’s base, it was much too heavy to transport to my studio so I completed the project on-site using a few photographs as reference. Posted on August 12, 2014 by Thoennes Studios, Inc. This is an unretouched RAW image file that has been resized only. Just to give you an idea of what some of my original files look like before I do magic on them. This was a great kitchen. Hammered copper sink, custom cabinets with butterfly marquetry, ceramic tile… amazing. Beautiful. Photography by Thoennes Studios Inc. My Nikon was flaming. Yes, I still go back to my roots once in a while and was excited to have this opportunity to switch hats from handyman to photographer. thekitchenlady@tkldesigngroup.com, or Judy as I call her had some wonderful kitchens and bathrooms she’d designed and directed and her company executed the designs. Judy hired Greg Thoennes of ThoennesStudios.com to shoot this work. 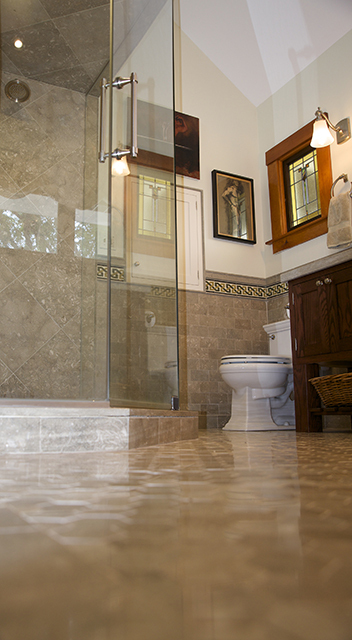 This picture was shot in the Miller residence and exhibits her stunning bathroom design. The shot is one of my favorites for the day. We shot three different residences in about two hours with very little setup except for a few portable strobes. I prefer natural light, minimal setup and quick results.